A little background–the black box warning is a thing that drugmakers, drug distributors, and investors of pharmaceutical drugs hate. It’s bad for business. The reason is clear–if you put a prominent warning on your latest smoking cessation drug (just to invent a hypothetical drug, you understand), saying it may cause consumers to become suicidal, that’s going to hurt sales. Reasonable people might say to themselves: “Gee, I want to quit smoking, but a side effect of suicide is something I just can’t live with.” Then they move over to your competition, a good self-help book. So, why are these warnings bad for business? They hurt profits. The FDA says that “Black Box carries the implication, ‘don’t you dare use this. '” What they fail to recognize is, the warning itself is supposed to jump out and, well, warn you. There’s not much special about the warning itself–it is in bold, and it is surrounded by a think black box. 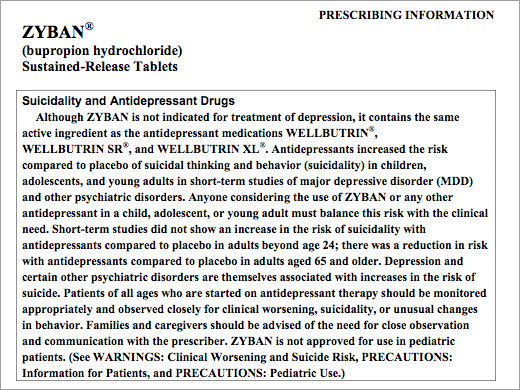 But, it’s still tiny print, and it may still be ignored by most people picking up prescriptions from their pharmacy. A rose by any other name is still a rose, but here any additional incentive to read the warning is a good thing. You’d think the FDA, which should be on the side of the consumers and safety, would want to encourage that line of thinking. . . .